Menorca is a wonderful island in the Mediterranean, approx. 35 km north-east of the larger island of Mallorca. In Menorca, the atmosphere is nice and relaxed and the island’s biggest asset is the varied and generally unspoiled nature. The breathtaking nature was the reason for UNESCO’s appointment of the entire island of Menorca as a natural biosphere reserve . In this way, Menorca may hopefully continue to live up to its Spanish nickname ‘La Isla verde y azul’, which in English translates into the green and blue island. 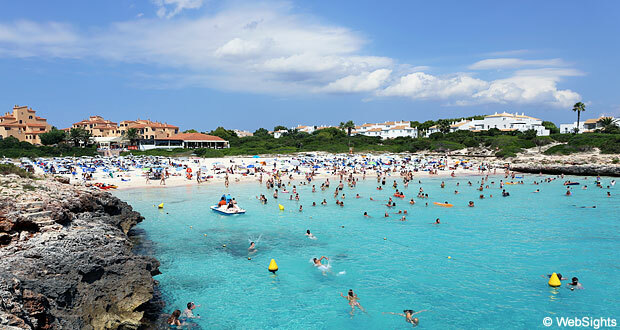 An important part of the nature in Menorca is the beautiful beaches. There is a 216 km coastline and 75 beaches – officially, anyway, but in reality there are more. The most popular beaches are located on the south coast, because the beaches here are more accessible and better protected against wind and waves. 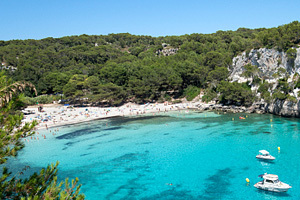 Some of the most beautiful natural beaches on the south coast are Cala Macarella, Cala Turqueta and Cala Mitjana. 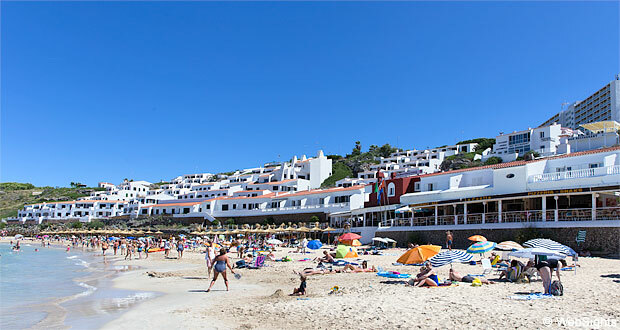 However, the beaches in the holiday resorts Cala Galdana and Cala’n Bosch are the ones with the most visitors. The north coast is more rough and unprotected and here there are many untouched natural beaches. Several of them can only be reached on foot, but then they are also less likely to be crowded. 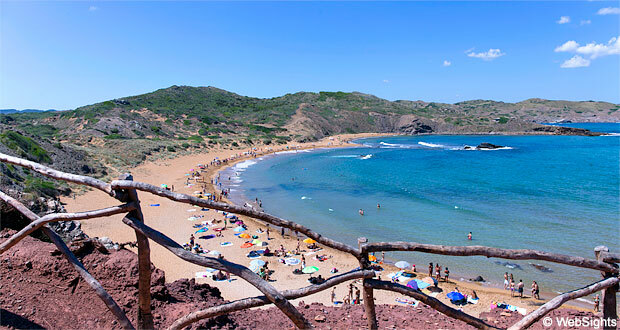 Some of the most beautiful natural beaches are Cala Presili, Cala Tortuga, Cala Cavalleria and Pregonda. However, the most popular beach on the north coast is Arenal d’es Castell, which is located in the holiday resort with the same name. Almost all the beaches are connected by the trail Camí de cavalls, which runs along the entire coastline of Menorca. In the old days, the trail was used by the British soldiers, who guarded the occupied island on horseback. In recent years, the trail has been restored and it is now possible to walk around the island along the coastline in a few days. The walk along the Camí de cavalls also leads past the two largest towns, Ciutadella and the capital Mahon. With their splendid architecture, good shopping facilities and historic quarters, they are both worth a visit. Well worth a visit are also the vineyards and cheese farms that may attract the connoisseurs. The cheese farms in Menorca are famous for their Mahon cheese, which can be bought in the many charming markets on the island. Another local speciality is the Sobrasada sausage, which is a mildly seasoned sausage made of meat from the Balearic black-footed pig. Seafood is also an important element of the Menorcan kitchen, especially the famous lobster dish caldereta de llangosta. On this website, you can read more about the towns, the beaches and the attractions. Welcome to Menorca.